Originally known as the Russian Wolfhound, the Borzoi temperament is loyal, calm, and agreeable. The breed’s history dates to 1650, where they were bred by Russian nobles. For quite some time, Borzoi’s were hunters for noblemen in their native Russia. After the Russian Revolution, the Borzoi’s popularity declined. But, they were brought to the United States in the late 1890s. Although their name changed from the Russian Wolfhound to Borzoi in 1936, they remain the glamorous, tall sighthound from Czarist Russia. Borzoi dogs are famously known for their gentle spirit. However, their personality also ranges from goofy and silly to quiet and respectful. The Borzoi does not do well when left alone for long periods. Learn more about separation anxiety and how to prevent it. The Borzoi is a large breed, but don’t let that fool you into thinking they’ll make a great guard dog. Borzois will let you know when a stranger is near, but they will rarely act aggressively. They are generally trusting of people and not shy. However, Borzois sometimes act aloof towards strangers. Post-puppyhood, Borzois have been compared to cats. While they adore affection, they are independent and have no problem entertaining themselves. They don’t need constant supervision. Borzois do well with other dogs, but they might not be the best companion for cats or other small animals. They are sighthounds, originally bred as trackers and chasers of small game. Borzois like children, but they do not like rough play. Small children should always be supervised as they can snap or even bite if they are pushed too far. Despite their laid-back personality, Borzoi’s are athletic and do best in a home where they can stretch their legs in a large, fenced backyard. 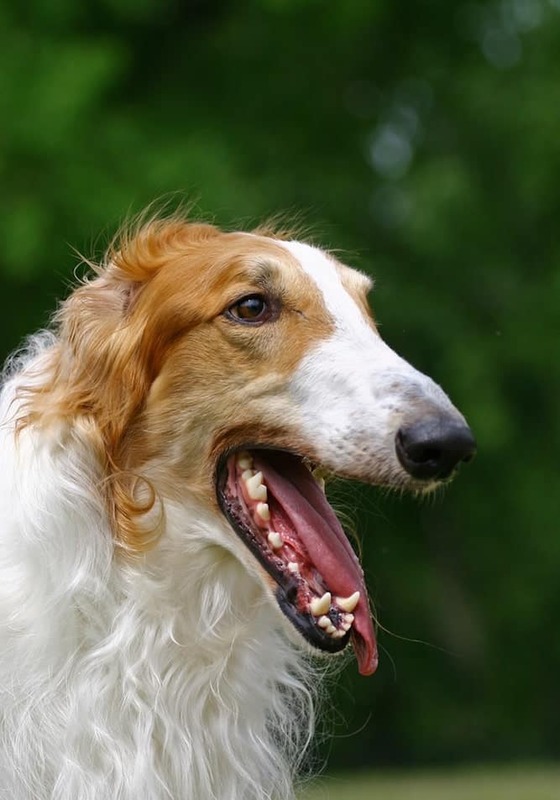 The Borzoi is a very intelligent and sensitive breed. They have a knack for picking up tension in the home. Too much tension can even make them physically ill. A harmonious home is a happy home for a Borzoi. Borzois are part of the hound family, meaning they can be a challenge to train. They typically have an independent temperament, can be stubborn at times and do not like to be told what to do. Training a Borzoi will require confidence, patience, – and a lot of treats. They may try and fool you into thinking they are untrainable, but they just need the right motivation. Positive reinforcement is the only way to train your Borzoi. Negative or harsh punishments will only cause them to ignore you or do the opposite of what you asked. You can successfully train your Borzoi with the right motivation, short training sessions, and a consistent schedule. The Borzoi is often compared to an Afghan Hound or Saluki based on their appearance. 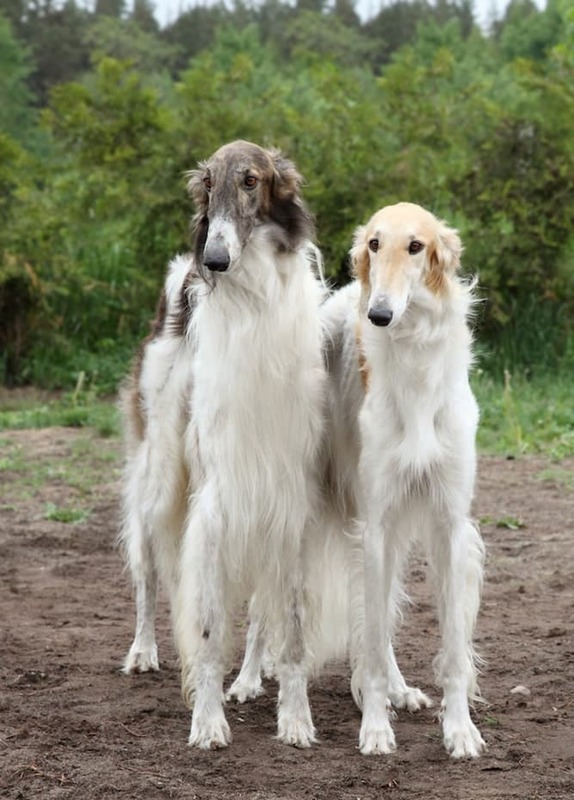 But, Borzoi’s are taller and weigh more. Their average weight is between 75-105 pounds. Male Borzois are about 28 inches tall while females are about 26 inches tall. 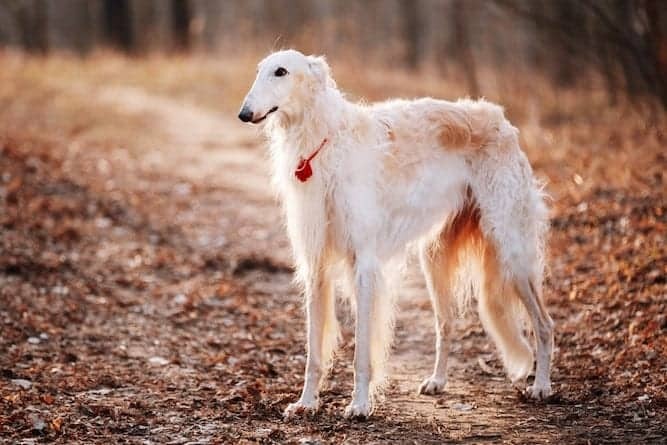 Borzois come in a variety of colors and they have a long, silky coat that can be curly, flat, or wavy. They have smooth, short hair around their head, ears, and front legs with curly hair around the neck. Their gorgeous, silky hair texture is dirt and mud resistant, so it is quite easy to keep clean. Borzois require weekly brushing with a pin brush as a wire brush could ruin their coat. They are seasonal shedders and often require extra brushing during that time. You only need to bathe your Borzoi as needed. Read this if you are new to grooming your dog for the steps to follow for great results. Borzois lifespan is typically between 9 and 14 years. And Osteochondrosis Dissecans (OCD -an orthopedic condition). Borzois do require a moderate amount of exercise – even though they are quiet indoors. Daily exercise in the form of long walks or runs will keep them in shape and tire them out. Since the Borzoi’s Russian days involved hunting, they naturally excel at fetch and other dog sports like agility and lure coursing. Ready to add this sweet-natured breed to your family? It’s time to do your research. Your first question should be: “Do I want a puppy or an adult Borzoi?”. Puppies are a lot of work! They require time and patience – lots of patience! Adult Borzois are often already housetrained and know basic commands – perfect for busy families. If you decide on a puppy, a breeder is your best bet. If you’d like an adult Borzoi, adoption may be the best option. The average price for a Borzoi puppy is between $1,000-$1,200. Keep in mind Borzoi prices are dependent on the availability of litters, location, and lineage. The average price of Borzois for adoption depends on where you adopt your Borzoi from (i.e. rescue organization or local shelter) as well as the age. For example, younger Borzois cost more than an adult or senior Borzois. The Borzoi Club of America has a Borzoi rescue resource and if you are interested in Borzoi adoption, there is the National Borzoi Rescue Foundation. Borzoi puppies are cute, but not every dog owner is fully aware of what it takes to own this breed. Borzois often find themselves in rescue organizations or shelters when a family isn’t fully aware of the Borzoi temperament. If you are looking for an older dog or are willing to open your home to a special needs Borzoi, adoption is for you! If you resort to your local shelter try these temperament tests to assess the temperament of the Borzois you are adopting. To find a purebred Borzoi for sale from a breeder, your first stop should the be the American Kennel Club Marketplace. You can search for Borzoi breeders based on location as well as pedigree. Don’t pick the first breeder you find. Shop around to find a breeder that makes you comfortable and is knowledgeable about the breed. Ask as many questions as you can. A responsible breeder will spend as much time as necessary with you to make sure the Borzoi breed is right for you! Borzois are an active breed. They love to run and don’t be surprised if you find them chasing something that catches their eye. They do well with other dogs and children but are not suitable for apartment life. These tall and slender pups are intuitive and well-mannered, making them the perfect family companion. Next post: Irish Water Spaniel Temperament: Ready for A Curious, Intelligent, Clown?